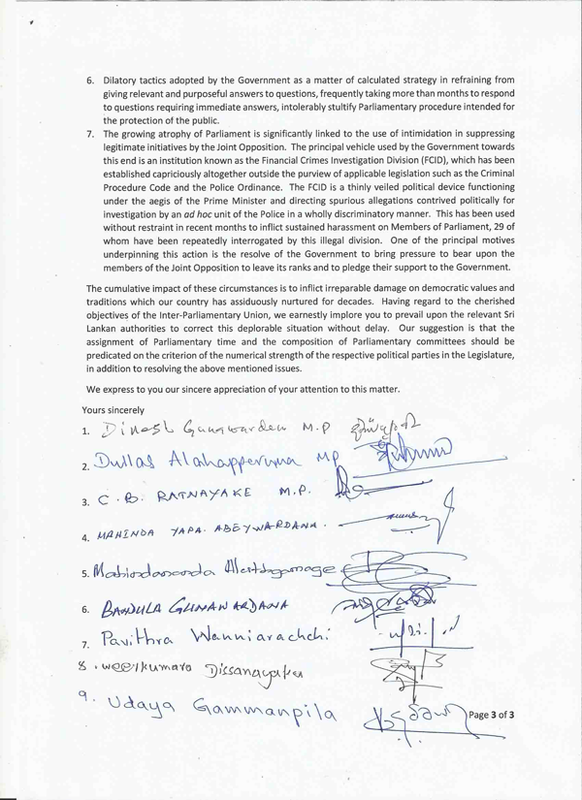 The three joint opposition MPs who went to Geneva have handed over a letter to the Inter-Parliamentary Union (IPU) General Secretary today and complained about the Financial Crime Investigation Division (FCID) among other allegations of injustice caused towards them by the Government. Joint opposition Organiser MP Dullas Alahapperuma and MPs Bandula Gunawardane and Udaya Gammanpila left for Switzerland on Wednesday to take part in a meeting with IPU General Secretary Martin Chungong. They met the General Secretary today and handed over the letter in which they highlighted seven key factors including a complaint on the FCID. “The FICD was established violating the Criminal Procedure Code and the Police Ordinance. It is a thinly veiled political device functioning under the aegis of the Prime Minister and making allegations to suppress the joint opposition. Already 29 MPs had been interrogated by the FCID. 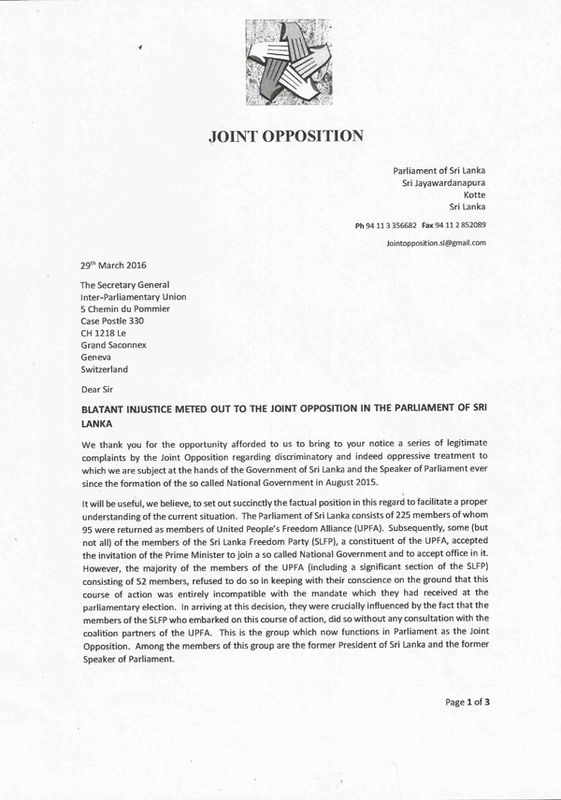 One of the motives behind this is to pressurize joint opposition MPs to join the Government,” the letter signed by nine MPs said. 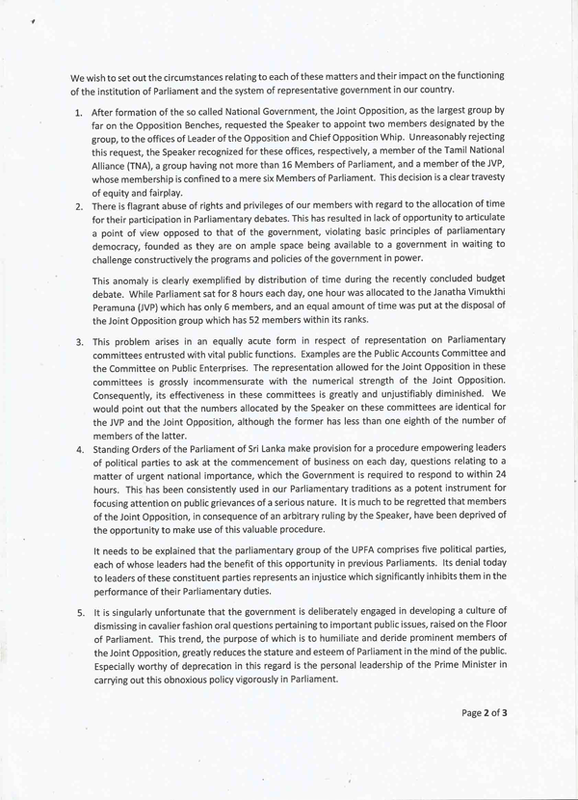 Abuse of rights and privileges of the joint opposition MPs, neglecting them when appointing Opposition Leader, Chief Opposition Whip, not providing enough representation at Parliamentary Committees, violation of basic parliamentary principles and denial of privileges of constituent party leaders were among the key matters taken up with the IPU by the MPs. They have also complained that the Government was dismissing answers to important questions to humiliate the joint opposition and taking months to respond to questions requiring prompt answers. It is good to see that you go to Geneva and not China. So much so, why then foreign judges? Hope they will return with their (immovable) "assets" intact! After their current mentor went to Geneva about JVP deaths during UNP times, they had the guts to accuse the UNP of taking things to international fora and allegedly looking for foreign judges, at least so that they can discover our judiciary's current independence. Now you are going back to Geneva. Shameful hypocrites? IPU in Geneva is confused!!!!! So now we have the list of culprits. If they have done nothing wrong why all this fuss!! !